So, today, despite all the grand and glorious questions that are swimming around in my head as we approach the 500th anniversary of the Reformation and regardless of all our concerns about our future together as a congregation, one question looms very large in my mind and perhaps more importantly, in my heart. 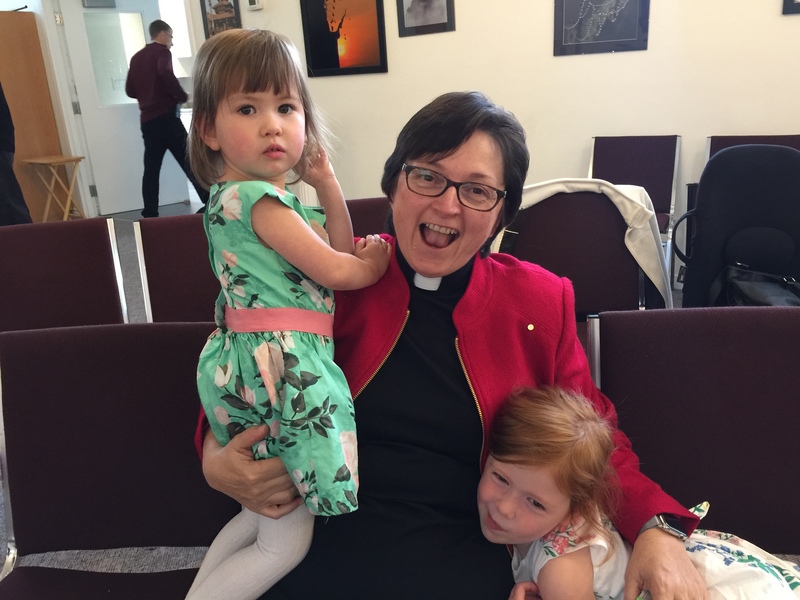 Today, my response to Martin Luther’s challenge to the church to be “Semper Reformanda!” – “Always Reforming” comes from my heart’s concern for my grandchildren. Looking toward the future of these little people, I cannot help but wonder what kind of church they will encounter as they grow into all that they have been created to be. Will they encounter an irrelevant, out of touch, Church, that is in so much denial about the realities of existence, that fails to respond to our changing understanding of what it means to be human, a church that holds tightly to ideas, doctrines and dogmas of a bygone era and cannot respond to the needs of the poor, the hungry, or the powerless? Or will they encounter a Church that has died a slow, agonizing death? Or maybe they will meet a living, thriving, vibrant Church that is relevant, responsive, and vital? Obviously, I am biased. I want my grandchildren, your grandchildren, indeed all children to encounter a resurrected church that speaks not only to their needs, but to the needs of the world, the needs of our planet, and most especially to the needs of the poor, the neglected, and the powerless. I want this generation and every generation to experience the church in reformation, always reforming, adapting, innovating, and responding to the ONE who IS the source of ALL, in ways that create justice and peace in every nook and cranny of Creation. Now, I know that there are all sorts of things that will need to change in the Church if we have any hope of living into the dream of all that we might become. Lots of things, ideas, practices, traditions will have to die before the Church can be resurrected. Some of our best loved, and most treasured, practices and traditions may indeed have to go. Some of us, perhaps many of us will be disappointed because the very thing we love most about the Church is the very thing that needs to die for the sake of resurrection. Sacrifices will have to be made. But surely, we, the people who claim to follow the ONE who sacrificed everything to show us the Way, surely, we, the people of resurrection, we cannot allow ourselves to live in fear of death? Death, there it is that word, Death. Is death the very thing that stands between us and resurrection? “Martin Luther ignited the Reformation of the 16th century by nailing to the door of the church in Wittenberg in 1517 the 95 Theses that he wished to debate. I will publish this challenge to Christianity in The Voice. I will post my theses on the Internet and send copies with invitations to debate them to the recognized Christian leaders of the world. My theses are far smaller in number than were those of Martin Luther, but they are far more threatening theologically. The hope for life after death must be separated forever from the behaviour control mentality of reward and punishment. The Church must abandon, therefore, its reliance on guilt as a motivator of behaviour. In my head, Jack’s vision of all that the Church might become is what I want for my grandchildren. But in my heart, what I want for my grandchildren, and for children everywhere, can be summed up in one thesis: Let the Church’s treasured tradition of focusing upon Death be replaced with a focus upon abundant life. Let the answers to questions that have no answers die so that the children of God can live here and now. For Jesus said, “I have come that they might have life and live it abundantly.” Let the truth set us free from our fear. Let the Church be resurrected into life, so that the children of God can seek the justice that leads to peace in this world. The answers to the questions that have no answers are not the answers that will save us from Death, nor are they the answers that will set us free from our fear of Death. We humans are finite beings and none of us can know what will happen when we die and that is scary. All we can do in the face of our fear of Death is trust that the Source of our Being is LOVE and that LOVE will enfold us whether we live or whether we die. There is nothing to fear, not if we know and trust in the LOVE that is God. So, let our worship and praise proclaim LOVE. Let our living and our dying be in, with, through and beyond, the LOVE that IS God. Let the Church be LOVE in the world, this world not the next world. Let the Church be LOVE in every nook and cranny of this glorious creation. Let us always be reforming for the sake of the LOVE that IS God! Semper Reformanda! Let the resurrection begin! This entry was posted in Adult Education, Bible Study, Evolutionary Christianity, Progressive Theology, SERMONS, STORIES, Theology and tagged John Shelby Spong Reformation, Lutheran Reformation sermon, progressive reformation sermon, Reformation Sunday by Rev. Dawn Hutchings. Bookmark the permalink.